Brussels sprouts are members of the cabbage family. Look for: Firm, fresh, bright green sprouts with tight-fitting outer leaves free from black spots. 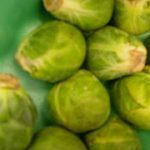 Puffy or soft sprouts are usually poor in quality. Any yellowing means they’re old, and likely bitter and tough; buy young, small sprouts (about 1 inch in diameter) that are tight and lively green. Preparation: Select green, firm and compact heads. Trim, removing coarse outer leaves. Wash thoroughly and immerse in brine (4 teaspoons salt to 1 gallon of water for 30 minutes) to remove insects. Sort into small, medium and large sizes. Blanch: Water blanch small heads 3 minutes, medium heads 4 minutes, and large heads 5 minutes. Cool promptly, drain, package, seal and freeze.